Let dough rise and double in size. Just before Ava was born, we started a weekly tradition on Friday nights to watch a movie and make a homemade pizza. 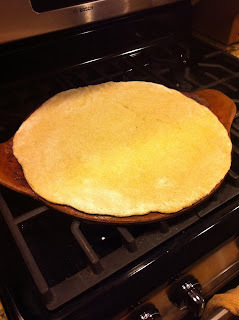 We started out using the Trader Joe's fresh, uncooked pizza dough. I'd roll out the dough each week for the pizza. Both the white flour and whole wheat options were great! But recently, I started to make our own pizza crust. Aaron thought I was crazy for buying flour in bulk at Costco, but we use it with all the baking and now pizza crust that I make from scratch. I really like the recipe from my favorite cookbook Feeding the Whole Family. The dough is hearty. You'll be satisfied by this crust by eating less pizza. That saves calories! Ava likes the thick crust and it's easier for her to hold. She prefers our homemade pizza over the daycare or restaurant pizza! Use 1/2 recipe for dinner and wrap the other half for the next pizza night. I make the pizza crust once every two weeks. It makes enough dough for two full-size pizzas. I use my Pampered Chef pizza stone to bake it. Parbaking is a key step to homemade pizza. If you put the toppings on the fresh crust, it may not cook through before the toppings are brown. Time savings: I'd recommend breaking this up in two steps. Make the dough and let it rise overnight or when you have a long afternoon at home. Then package the dough. Later come back to the dough to make the pizza. To make dough: combine the yeast in lukewarm water in a large mixing bowl or stand mixer. Let rest for 10 minutes while the yeast comes to life. Gently stir in olive oil. Mix salt and whole wheat pastry flour. Using the paddle attachment, mix flour with water/yeast mixture. Beat until stretchy or elastic. 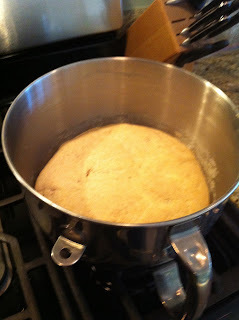 Add unbleached flour to make a soft dough. Change paddle attachment to the dough hook and knead until the dough is combined. Cover and let rise for 1-2 hours OR overnight. **Often times, I let the dough rise overnight and on Friday morning, I do the next step to package in the refrigerator. To make the pizza: deflate, divide and shape into 5-6 balls or 1/2 in making large thick pizzas. Relax the dough for 15-minutes.Smaller balls will make 8-inch pizzas, which is fun for customizing toppings for family members. **At this pint, package the dough in plastic wrap, then a plastic bag. You can either refrigerate or freeze the dough at this point. Preheat oven and pizza stone to 350 degrees. Shape the dough by using your finger to make tapping indentations rather than pulling the dough. I've also used the rolling pin too. 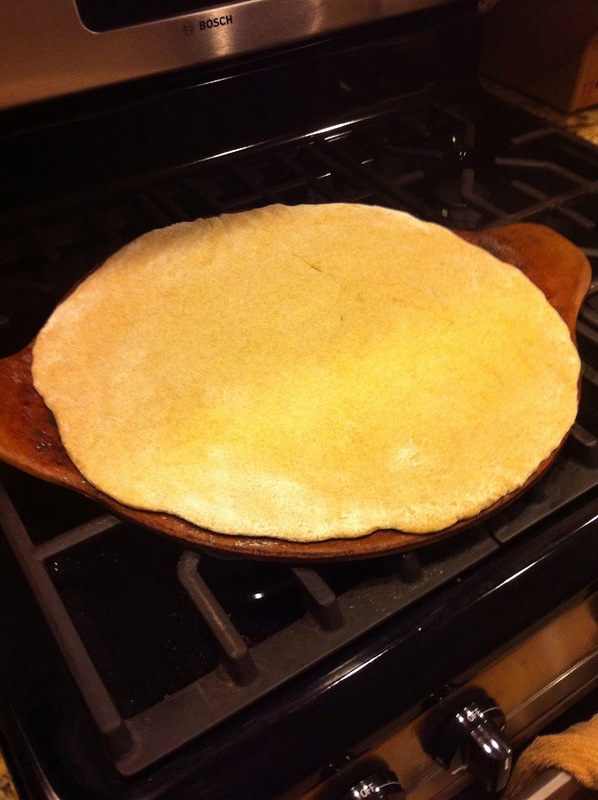 Place the dough on the pizza stone or baking sheet coated with cooking spray. Parbake large pizza for 10 minutes. OR small pizzas don't require parbaking. Add toppings and cook on 500 degrees for about 6-minutes on the lowest rack. If you parbaked, add toppings then bake for another 11-12 minutes on 350 degrees. Pizza dough rolled and ready for parbaking. Friday Night Family Pizza Dinner. Our favorite pizza combo is fresh spinach, olive, and cheese and we love it with Caesar salad. Time for a movie! 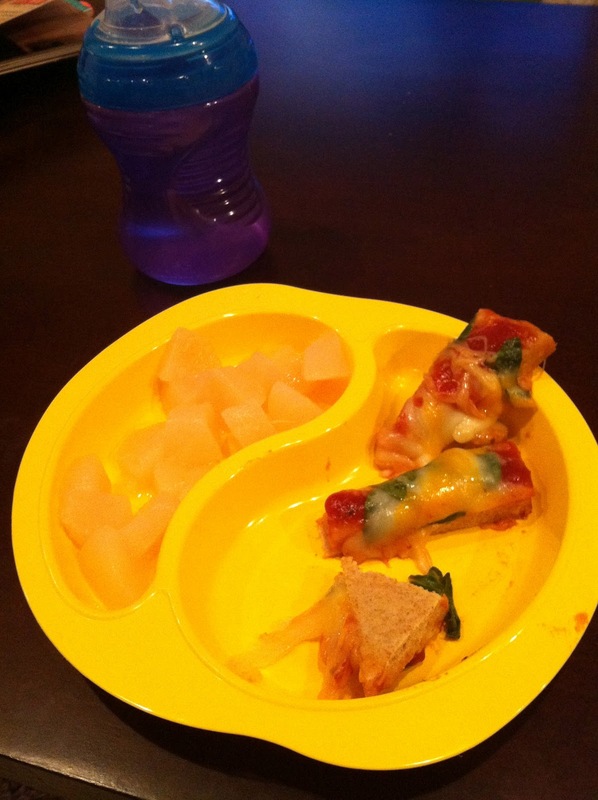 Ava's plate! She loves pizza and we serve her fruit on the side. When she's using her play kitchen she talks about making pizza.